Hi, just noticed this neat little chart.. shows the avearage Volt user in the US , how many miles driven , Shows 76% of Volt owners use 40 miles. For me, I wanted an Extended Range EV. .I got the idea from Posts on AEVA, (Think it may have been Woody's Cortina posts) Here it is.. In my Volt, it is curently showing .8 litres per 100 km's, so mainly driving short distances in pure EV mode. The volt sometimes goes into EMM (engine maintenace mode) to keep the Petrol generator maintained. This uses a small amount of fuel each 6 weeks. (about .3 litre) . The Volt has become my daily driver, and the Ice Car sits waiting for a drive. Last edited by marty11 on Sun, 06 Oct 2013, 06:51, edited 1 time in total. But please, the volt is your ICE car. If you got rid of the other ICE car it would save more money to help pay for the volt ! Yes, the daily drive figures remind us that the range in pure electric is the important thing. My real ICE is a Holden Station wagon for towing the trailer and carrying building materials etc, so wont be getting rid of that for a while! The Volt owners appear to use their cars to get used to the idea , (and they usually like it), of driving in pure EV mode. A lot of them are looking at a 02nd car to buy as a pure ev, such as the Leaf, Chevy Spark or a Tesla. I had ordered a Tesla but got nervous at the price so let it go. Also have a Mazda Astina 96 model which I was going to convert myself, or get someone to convert it to EV, (like a specialist shop) but I ran out of time through work, so its for sale. I like reading the members machines section, and seeing what others successes are, in the DIY part of EV conversions. If anyone needs a charge in Jindabyne let me know! Last edited by marty11 on Tue, 08 Oct 2013, 04:01, edited 1 time in total. That's a really good observation ! Don't mind me with my grumbles over hybrids. I am perhaps fortunate in that my typical run is within pure EV range but definitely outside hybrid range so the ICE would have to start twice a day, rather than occasionally. Good on you for diving in. Mmmm, Jindabyne, a long way for a charge...... A volt could make it thought. 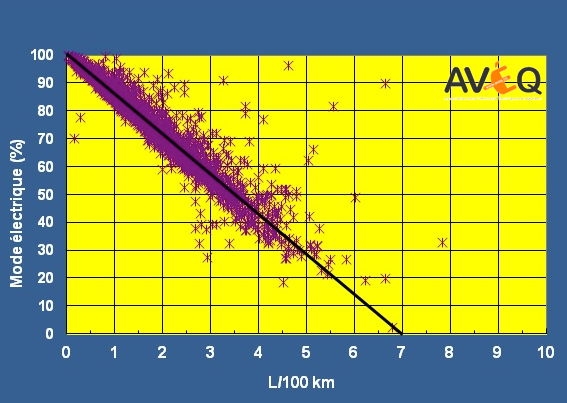 Also the website VOLTSTAT posted some info and the website AVEQ posted a graph of the average fuel comsumption of more than 2000 Volt owners was by uploading their Data with Onstar. This graph present the Liter of gas per 100km depending on teh proportion of the % of electric mode use. Would be good to know other PHEV and EV's compared to ICE's. Real data. Not Just from algorithm tests on Dyno's. And how does the dyno test allow for regen? No wonder there is a faint whine when in hold mode and also after 10.5 kwh of battery has been used. Hence it is not a true series hybrid like the BMW i3 but is more like the Outlander phev. 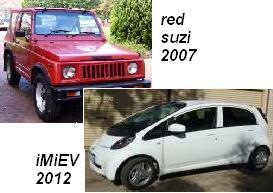 It is an Ev, series and parallel hybrid. The whine is good to test how good your hearing is. Last edited by g4qber on Sun, 07 Sep 2014, 04:48, edited 1 time in total.